Telkens men tegen internationale jurisdicties durft pleiten, lijkt het meteen alsof de criticus in kwestie wel een aanhanger moet zijn van onfrisse figuren zoals een Omar Al-Bashir of een Radovan Karadzic. 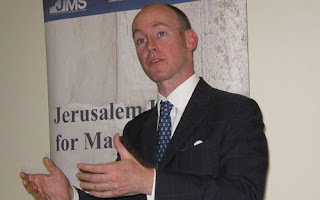 Toch waagt het Britse EP-lid Daniel Hannan zich vandaag op zijn blog aan zo'n pleidooi. Vorige week gaf hij over dit thema - in de nasleep van de gênante aanklacht in het VK tegen oud-premier van Israël Tzipi Livni - trouwens ook al een lezing voor het "Jerusalem Institute for Market Studies". Hannan viel in die lezing de internationalistische idee aan dat monsters die in hun eigen land niet vervolgd worden, toch elders - en bij voorkeur door internationale bureaucratieën - berecht zouden moeten kunnen worden. Over de affaire-Livni zei Hannan het volgende: "We zien hier exact wat er mis is met het alsmaar groeiende corpus van internationaal afdwingbare mensenrechtenwetten: dictators en terroristen negeren die en worden met rust gelaten, democratisch verkozen politici willen ze eren maar worden desondanks gestraft." Daniel Hannan haalde in zijn lezing de volgende zeven ideeën aan. 1. Territorial jurisdiction has been a remarkably successful concept. Ever since the Treaty of Westphalia in 1648, it has been broadly understood that crimes are the responsibility of the state where they are committed. Untune that string and hark what discord follows! Western liberals might say: “Since Karadzic won’t get justice in Serbia, he should get it at The Hague.” But an Iranian judge might apply precisely the same logic and say: “Adulterers in Western countries are going unpunished: we must kidnap them and bring them to a place where they will face consequences”. 2. International jurisdiction breaks the link between legislators and law. Instead of legislation being passed by representatives who are, in some way, accountable to their populations, laws are generated by international jurists. We are, in other words, reverting to the pre-modern notion that law-givers should be accountable to their own consciences rather than to those who must live under their rulings. 3. In consequence, as Robert Bork has argued in Coercing Virtue: The Worldwide Rule of Judges, an agenda is being advanced which has been rejected at the ballot box. Courts make tendentious and expansive interpretations of human rights codes which go well beyond what any reasonable person would take the text to mean. 4. With no meaningful scrutiny, international lawyers are able to suit themselves, meandering their way through gargantuan budgets, changing their own rules when they become inconvenient. As John Laughland showed in his study of the Milosevic trial, the International Criminal Tribunal on Yugoslavia admitted hearsay evidence, repeatedly amended its rules of procedure and, when the old brute proved surprisingly eloquent in his own defence, took the extraordinary step of imposing counsel on him. Eight years and $200 million later, with the court no closer to a verdict, both judge and defendant were dead. 5. Indicting a head of state – as the ICC did last year when it served a writ against the Sudanese President – amounts to declaring a war which one has no intention of fighting. The only way to bring President Bashir to trial would be to conquer his country and transfer sovereignty from him to the occupying powers: the basis of the Allies’ jurisdiction at the Nuremberg trials. Without such a determination, international arraignments are declamatory: a way for those who serve them to feel good about themselves, even though their practical effect is to make tyrants dig in more deeply. 6. Which brings us back to the main objection. While tyrants ignore international rulings, democracies – or, more precisely, judges within democracies – don’t. Courts in Western countries increasingly use international conventions to challenge the decisions of their elected governments. Four successive Labour Home Secretaries have tried unsuccessfully to repatriate the Afghan hijackers who diverted a flight at gunpoint to Stansted. Despite the nature of their crime, and despite the removal of the Taliban regime from which they claimed to be fleeing, they have been granted leave to remain in the UK through, in effect, judicial activism. 7. The politicisation of international jurisprudence seems always to come from the same direction: a writ was served against Sharon, but not Arafat. Pinochet was arrested, but Fidel Castro could attend international summits. Donald Rumsfeld was indicted, but not Saddam Hussein. En ook in de conclusie op zijn blog kan ik best inkomen. Dit opiniestuk verscheen oorspronkelijk op Daniel Hannans weblog. Meer teksten van deze Europarlementariër op www.hannan.co.uk. Ook in het verleden was Dan Hannan al een fervent tegenstander van de VN-tribunalen. Ik heb daar ook ten tijde van de dood van Milosevic in VN-gevangenschap aan mijn blog wat aandacht aan besteed. Dit opiniestuk van Pieter Cleppe werd in het Tsjechisch vertaald en als coverartikel in het januarinummer van het ledenblad van het Centrum voor Economie en Politiek gepubliceerd. In dat tijdschrift vindt hij zich trouwens in het gezelschap van Vaclav Klaus zelf. "Meet Your New President: Herman Van Rompuy"
Since January 1st, 2010, the Czech Republic has a new President. Sure, Václav Klaus is still “President of the Czech Republic”, but as he rightly indicated himself, the Czech Republic ceased to be an independent state because he had to sign the Lisbon Treaty. Most people still think of the European Union as an “international organisation”, which it was, but few are aware that since the Lisbon Treaty has entered into force, one can easily argue it has become a “Sovereign State”, as Lisbon has conferred it with “legal personality” and therefore the full capacity to enter into relations with other states and sign treaties, which it lacked before. Apart from a permanent population, a defined territory and a government, that is the fourth element needed to comply with the definition of a state, according to the Montevideo Convention, which is the codification of the declarative theory of statehood in international law. Not only legally but also in the facts should the EU be considered a state, given its large powers over almost everything. That 62.5% of all Czech laws are coming from Brussels is just one example. President Klaus is merely the President of one of the constituting elements of this newly formed federal State. It was Herman Van Rompuy, the former Prime Minister of Belgium, who has been chosen to become “President of the European Council”. This “European Council” operates alongside the other branches of government of the European Union, which are the Council of Ministers, the European Commission, the European Parliament and the EU judicial branch. Van Rompuy’s European Council is the most important branch, as the EU Treaty notes it “provides political direction to the European Union”. Therefore, more than Commission President Barroso, he should be considered to be European President, presiding over all European citizens, including those in the Czech Republic. Wouldn’t it be relevant then for Czech citizens to know which plans Van Rompuy has for them? There hasn’t exactly been a transparent process of selecting the new President, as the Latvian candidate Vaira Vike-Freiberga said the selection process is 'Soviet' and an Eastern European diplomat compared it with “decoding who was in or out in the Kremlin in the 1970s”. Therefore Van Rompuy didn’t really write a proper election program so one can only resort to what he has said in the past about the EU. The first thing one can say is that he seems to have a preference for disclosing his plans for citizens on secretive gatherings. Just before he was elected, he explained his idea to finance the EU budget through direct EU taxes at a meeting of the Bilderberg group, an unofficial, invitation-only and very secret elite conference. Not that there is something wrong with going there, but it can only make one wonder whether he’s suspecting the public might not agree with him. On a rare outspokenness, he was caught reacting on the no votes to the European Constitution in the Netherlands and France in 2005, reportedly being very relieved that there had been no referendum in Belgium. He told he hated the debates in France and the Netherlands, in which he discovered a sort of demagogy to which “even the calculating citizen lends a willing ear”. Also at that time, Van Rompuy gave a speech to the Belgian Parliament, in which he said: “We go on with the ratification of the European Constitution in all our parliaments, but we need to admit that for the moment the project is over. However, this doesn’t mean that we cannot continue to work in a creative way in the direction which the Constitution points. I don’t mind if we break up the Constitution into smaller parts, as long as we continue to work in the same direction: in the direction of more Europe.” And so it was. So much for his democratic credentials. Another example of how he prefers to do things “through the back door” is how he said, back in 1989, as President of the Flemish Christian Democrat Party: “Once Economic and Monetary Union has been realised, the realisation of political union will get an extra boost as a logical and indispensable complement of EMU”. So translated to the current discussion on whether or not to bail out for example Greece, it leads no doubt that Van Rompuy will do everything in his power to abuse the situation when an EU country is in financial trouble by pushing for a federal EU budget to pay for the losses. The fact that taxpayers of other European countries would then have to pay for the mistakes of a government they didn’t vote for, will be of no importance. This is just along the lines of the manifesto of his Christian Democratic party, where he has always been one of the top figures. It calls for huge transfers of power to the EU, noting that "taking decisions by majority needs to become to rule, also in domains which are traditionally very closely connected with national sovereignty, such as justice, internal affairs, fiscal matters, social policy and foreign policy." It proposes that “apart from the euro, also other national symbols need to be replaced by European symbols (licence plates, identity cards, presence of more EU flags, one time EU sports events”. Being critical of some forms of nationalism is probably a healthy thing, but that shouldn’t mean one becomes a fanatic European nationalist. Andrew Rettman schreef onderstaand artikel voor de EU Observer naar aanleiding van een interview met Pieter Cleppe. "EU-funded think tanks defend their credibility"
The European Commission will in 2010 pay €6.7 million in subsidies to a group of think tanks and NGOs. The grants cover 58 organisations, ranging from some of Brussels' best known talking shops, such as Cafe Babel and the European Policy Centre (EPC), to niche bodies such as the European Paralympic Committee. The top recipients are: the Platform of European Social NGOs; Notre Europe; the European Council on Refugees and Exiles; the European Movement; Association Jean Monnet; the Council of European Municipalities and Regions; the Association of Local Democracy Agencies; the Lisbon Council; the Fundacion Academia Europea de Yuste, and Friends of Europe. The money is part of a larger €30 million a year pot in the commission's education and culture department, which pays for a scheme to promote "common values" and to get ordinary people interested in politics. "I think it's fair that an EU citizen should learn about the European Union of which he or she is a part. We make no apologies for explaining what the EU is about," commission spokesman John Macdonald told EUobserver. But for some, Brussels' generosity is not so innocent. "They are setting up their own committees claiming that these are independent think tanks when, in fact, they are cheerleaders for the EU," Pieter Cleppe, from the British eurosceptic think tank, Open Europe, said. "They do not question the EU to the extent they would if they were not being funded by it. That's the whole point of the grants." Several of the beneficiaries, such as the European Movement International, Friends of Europe and the Union of European Federalists, have an openly pro-integration position. Just one, Statewatch, which gets 39 percent of its budget from the commission, is a devoted critic of the EU institutions. Mr Cleppe's allegations are potentially the most damaging for policy analysts, such as the EPC, the Centre for European Policy Studies (Ceps) or Notre Europe, whose reputation for objectivity is central to their work. EPC chief Hans Martens pointed out that its grant of €146,000 makes up just over five percent of its budget. "You can't buy us for that price," he said. "There are no strings attached. We've never felt any pressure because of it. If we were to say something which offends the commission, tant pis." Tant pis? Ceps spokesman Marco Incerti took a similar line. "Our grant [€140,000] amounts to 2 percent of our budget. So if there was ever an attempt by the commission to influence us, we could afford to lose it," he said. Mr Incerti noted that if you count all the EU projects in which Ceps takes part, EU institutions sign off on about a third of its income, however. For others, EU dependency is still more acute. Pour la Solidarite gets 65 percent of its funds from the commission's education department grant. The Trans European Policy Studies Association is in for 58 percent. Notre Europe gets 54 percent. "We get a big grant but we don't work for the commission per se. We are true to what we think," Notre Europe's funding officer, Jennifer Hoff, told this website. "We are really trying to diversify our funding because we do get criticised for this." De EU wil denktanks promoten en heeft daar 30 miljoen euro per jaar voor veil. Dat is een peulschil, een almoes in vergelijking met Amerikaanse denktanks die vaak per organisatie al een jaarbudget hebben van 30 miljoen euro of meer. Ofwel doen we niets, ofwel doen we het goed. Nu is het noch vis noch vlees, typisch Europa. Het gaat om 7 miljoen ipv 30 miljoen. Marcel, er is een wereld van verschil tussen de States waar denktanks PRIVAAT gefinancierd worden en Europa waar die op de kap van de belastingbetalers PUBLIEK geld krijgen. De Europese denktanks zijn NGO's en eigenlijk geen haar beter dan de OXFAM's van deze wereld. Dat Herman Van Rompuy enkel in België als Europees President gevierd wordt, is al langer bekend bij de lezers van deze blog. Buiten het legioen Eurocraten en enkele raszuivere federatiefundi's gelooft niemand dat Rumpy de goede keuze was. Het was vrijdag dan ook genieten toen ik deze foto's uit Praag toegestuurd kreeg. De nieuwe klassiek-liberale Tsjechische partij OSS van econoom Petr Mach profileert zich meer en meer als de Tsjechische versie van de Zwitserse FDP. Zij zijn economisch libertarisch en Eurosceptisch, en de partij wil een nieuw thuis worden voor de Klaus-vleugel binnen de conservatieve ODS-partij. Vrijdag bracht Rumpy een staatsbezoek aan Praag en deze foto's tonen mooi aan wat (een bepaald deel van) de Tsjechische bevolking van dat bezoek vond. Hannan heeft natuurlijk gelijk. Onze vrijheden kunnen enkel beveiligd worden binnen een democratisch politiek bestel, en dus ondermeer door de rechtspraak die samengaat met een democratisch politiek bestel (wat ondermeer onafhankelijkheid tussen de drie grote Constitutionele Machten vereist). De 'internationale gemeenschap' is bijna het tegenovergestelde van een 'democratie', en haar rechtspraak zal dus steeds 'willekeurig' en politiek-gekleurd zijn. Het grootste gevaar dat onze vrijheid onmiddelijk bedreigd is het verlies van interne democratie. In Belgique, waar meningen arbitrair kunnen gecriminaliseerd worden door de overheid, is men al een heel eind op die weg gegaan. Het tweede grootste gevaar is het accepteren van "internationale jurisdictie" zonder enige duidelijk-gespecifieerde condities. Omdat zulke acceptatie onvermijdelijk elementen van verpolitisering binnen de eigen rechtspraak brengt. Die internationale rechters vomen geen onderdeel van een ruimer democratisch politiek bestel met echte 'scheidng van de Executieve, Legislatieve en Juridische Machten', waar er er uiteindelijk verantwoording moet afgelegd worden aan de kiezers. Vanuit democratisch standpunt bezien kan 'internationale jurisdictie' enkel aanvaard worden wanneer ze OP VOORHAND wordt geaccepteerd door een democratische overheid voor SPECIFIEKE gevallen of problemen en voor BEPERKING IN TIJD. Het Milosevic geval is dus geen goed voorbeeld om internationale jurisdictie aan te vallen, vermits het daar om een tribunaal ging dat SPECIFIEK werd opgericht om de gruwelijkheden van de dissollutie van Joegoslavia te berechten, en democratische overheden zich op voorhand akkoord verklaarden omtrent de 'limitaties' van dat specifiek tribunaal. Men zou het een voorbeeld kunnen noemen van sub-contracting van een specifiek probleem door politiekers die uiteindelijk kunnen 'gestraft' worden door kiezers. Dat belet niet dat dat specifiek tribunaal een 'slechte job' zou kunnen gedaan hebben. Maar, het bestaan zelf van dat tribunaal was niet anti-democratie. Het ICC, daarentegen, vormt een regelrechte bedreiging voor de vrijheden van de burgers van landen die dat verdrag hebben onderschreven (gelijk Belgique). Omdat zij een 'blank cheque' hebben gegeven aan een internationale bureaucratie waarover zij geen controle hebben. Manifeste verpolitisering van het gedrag van de ICC is iets waar Belgische burgers absoluut niets meer kunnen aan doen in de toekomst. Zij hebben hun vrijheid 'kwetsbaar' gemaakt voor manipulatie door totalitairen rond de wereld. The idea was "let's discuss it." "It's a great topic to discuss." ICC before in meetings; this is my take an international sociological honor student. SPAIN's diplomatic gesture of international justice insofar as, Serbia, in all of this is, disgusting morally! I represented the state interests' of the Former Yugoslavia, in Darko Trifunovic’s absence in those meetings and I am proud to undertake this effort on Serbia’s behalf. Kan ik deze site ook op facebook of twitter volgen. Eindelijk eens een site met goede inhoudelijke info.